Yankee Doodle Brandy: Combine white wine and Grand Marnier orange brandy for July 4th (photo courtesy Elegant Affairs). 1. MAKE the simple syrup: Boil 1/2 cup water, then add 1/2 cup granulated white sugar. Turn the heat to simmer and stir until dissolved. Turn off the heat and let the syrup cool. 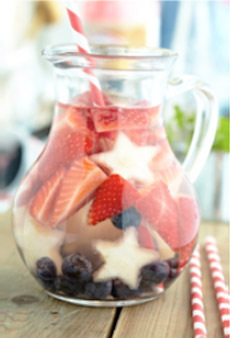 2.COMBINE all ingredients except the fresh fruit (but including the simple syrup) in a large punch bowl or pitcher. Stir well and add the fruit. Cover and refrigerate at least 4 hours. 3. SERVE well-chilled with a good scoop of fruit floating in each drink. If you plan to serve over ice, consider making star-shaped ice cubes. Substitute a 64-ounce bottle of Sprite/7-UP or Diet Sprite/Diet 7-UP for the wine. Replace the triple sec with 1 cup white cranberry juice. Optional: Add blue food color to make blue star ice cubes. Use the same fresh fruit as for the sangria recipe.